A few weeks ago, I shared with all of you my favorite civilized portion of our trip to the UK-- Little Moreton Hall-- and now it's time to end it all with my favorite uncivilized part: the day trip we took from our rental cottage in Saltburn on the shores of the Cromarty Firth to the most remote village in the northwest of Scotland: Durness. 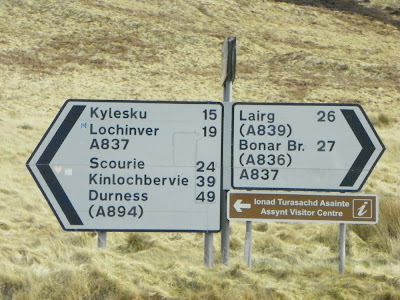 You might wonder how I even knew Durness existed, and it all boils down to the fact that my husband, Denis, is a huge John Lennon fan. 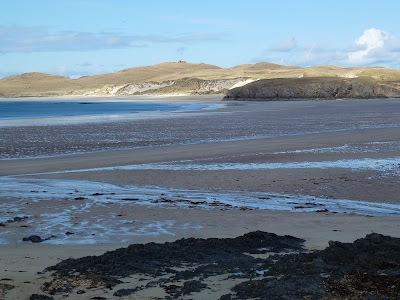 In reading something about Lennon one day, I noticed that when he was a child, Durness was where he and his family would go on summer holiday. When I read "Scotland," "Highlands," and "beaches," I searched for images of Durness, and what I saw convinced me that we had to go there. The weather at the beginning wasn't very promising. Our route was a bit of an oval because, when you're out exploring, you don't want to return to base the exact same way that you started out. It was cold and windy, with dark grey clouds above, the pewter glint of lochs, and mountains buried in snow. 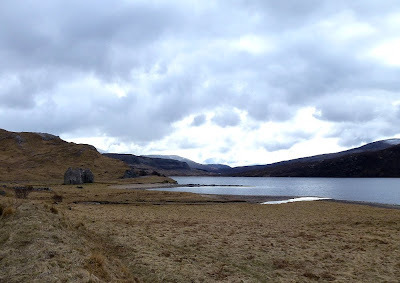 Even though the skies were forbidding, my heart was light because I was out exploring in one of my favorite spots in the whole wide world, the Highlands. The sight of small frozen burns and waterfalls made me happy to be in a warm rental car! Have you ever seen a small house in a remote area and wondered what it would be like to live there? That's what I did when I saw the cottage in the photo above. 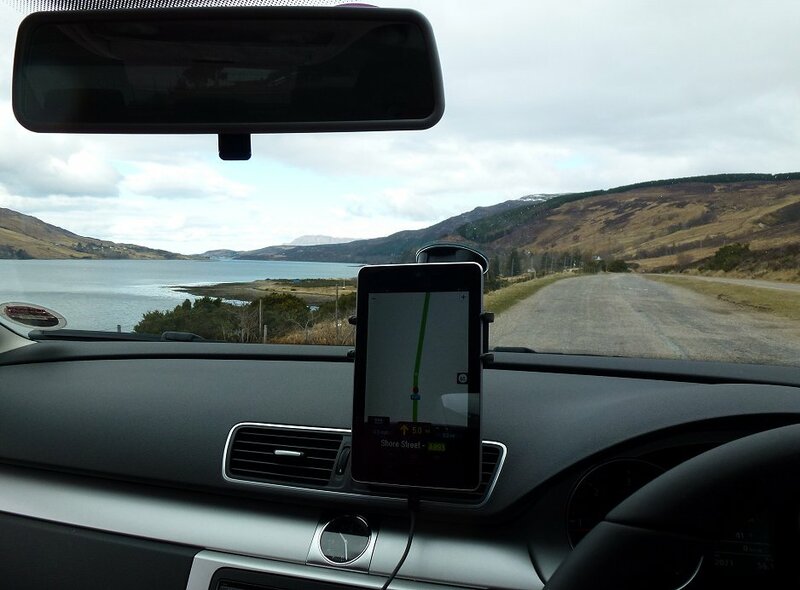 In the photo above, you can see that the steering wheel is indeed on the right, and that we were being guided by Denis's GPS (which did an excellent job throughout our travels). 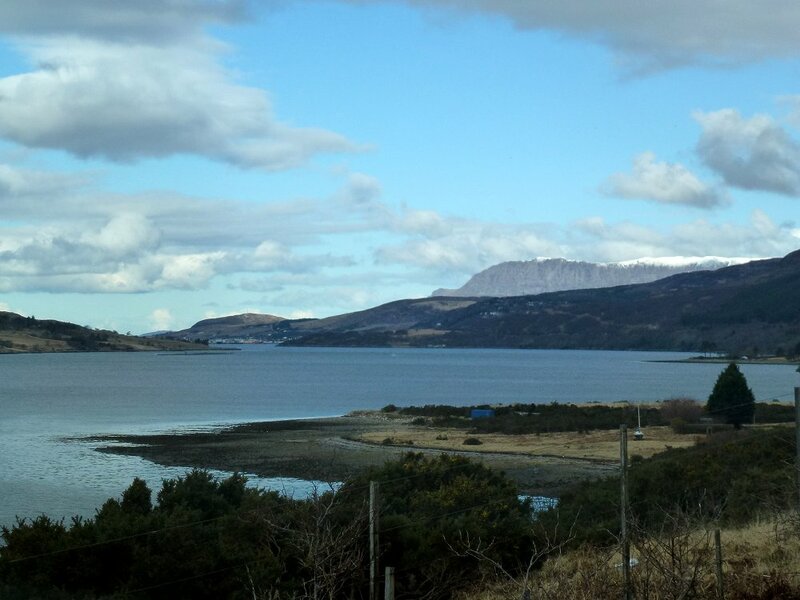 We stopped because it was our first view of Ullapool-- and the last town of any size we would see for many miles. Ullapool is a major tourist destination in the Highlands, and on a future trip, I intend to board the ferry at Ullapool and journey to the Isle of Lewis in the Outer Hebrides to see the standing stones of Callanais. 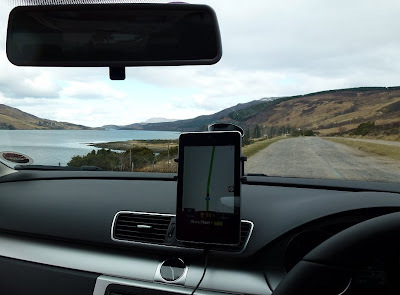 We drove through the streets of Ullapool and parked the car for a few minutes so Denis could bring up the next section of our journey to Durness on his GPS. There's a signpost up ahead! Perhaps it's time to tell you a bit about the British road numbering system. You can see a bit of it on the road sign above. Any road beginning with an "M"-- as in M60-- is a motorway (or interstate to Americans). Limited access, higher speed limits, at least four lanes. A road that begins with an "A" is a primary road-- like a highway in the US. A paved, major road. "B" roads are secondary roads, like the county roads or two-laned blacktops that connect all the little towns in central Illinois where I grew up. Why am I telling you this? 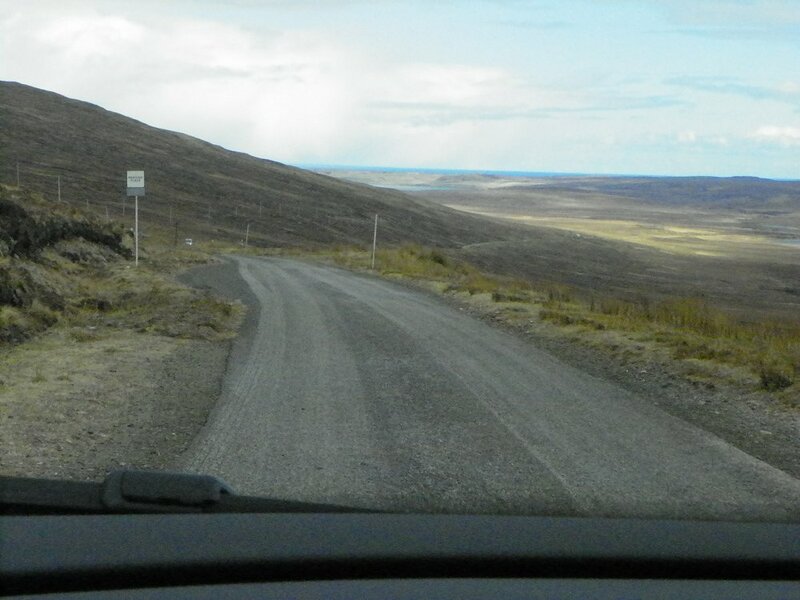 Because you're going to be able to see just what an "A" road looks like in a remote area, that's why! We turned left and hadn't traveled very far when we came to some ruins on the shore of Loch Assynt. 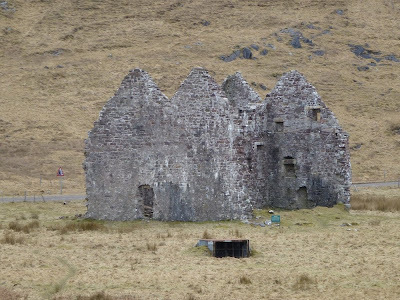 The first ruin was Calda House, a Georgian mansion built in 1726 for Kenneth MacKenzie of Assynt. 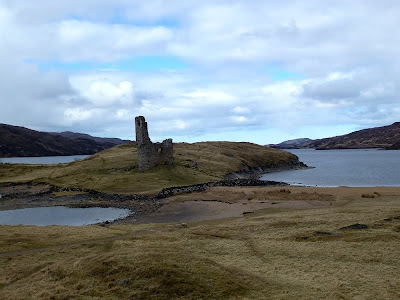 His wife, Frances, had tired of living in nearby cold and drafty Ardvreck Castle, and persuaded her husband to build the first mansion in the area. It was so grand that it put Kenneth into debt and forced him to put it up for sale. 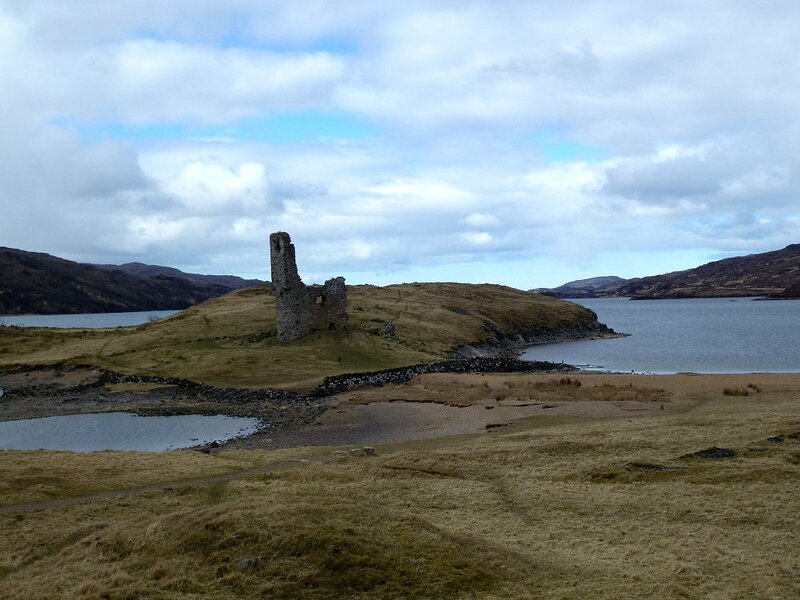 Calda House is within sight of Ardvreck Castle. As you can see, it's cut off from the mainland at high tide-- and you can also see that the gloom was dissipating, and we were beginning to see patches of blue in the sky. That didn't prevent us from getting caught in a small rain shower, however! This bridge was our next opportunity to get out into the frosty, bracing air and look down into the frigid waters of Loch Cairnbawn, which was the site of the World War II midget submarine training base. 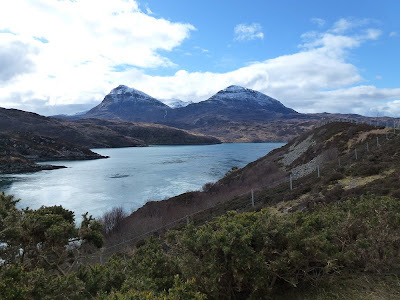 The sun had finally decided to shine with a vengeance, and the combination of sky, mountains and loch was so beautiful it almost took my breath away. (I say almost because the wind had already accomplished that!) I've never seen water that looked as cold as it did in Loch Cairnbawn. Now you can see why I told you a few facts about the British road system. The road you see in the photo above is a one-lane road, yet it is the major road here. This should tell you quite a bit about how remote it is. 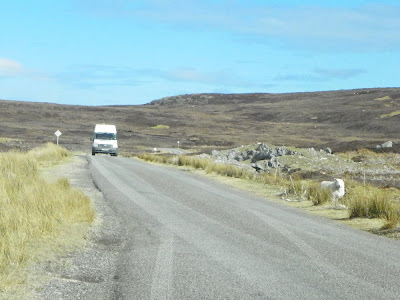 In case you're wondering what happens if a vehicle comes from the other direction when you're on this one-lane road, there are passing places all along the route where you can pull over and wait for the other vehicle to pass. (Everyone waves hello to each other, by the way.) 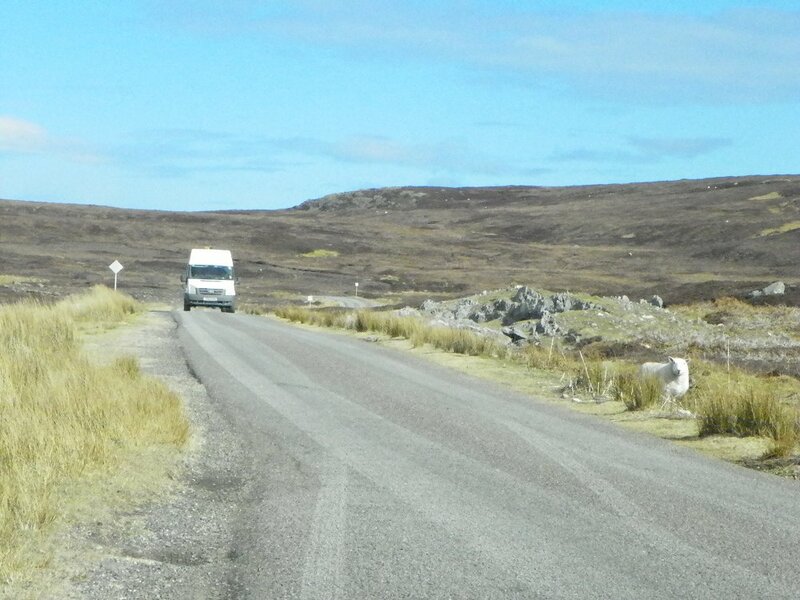 Oh... and did you notice that this was a bit of a traffic jam with a van and a sheep to contend with? 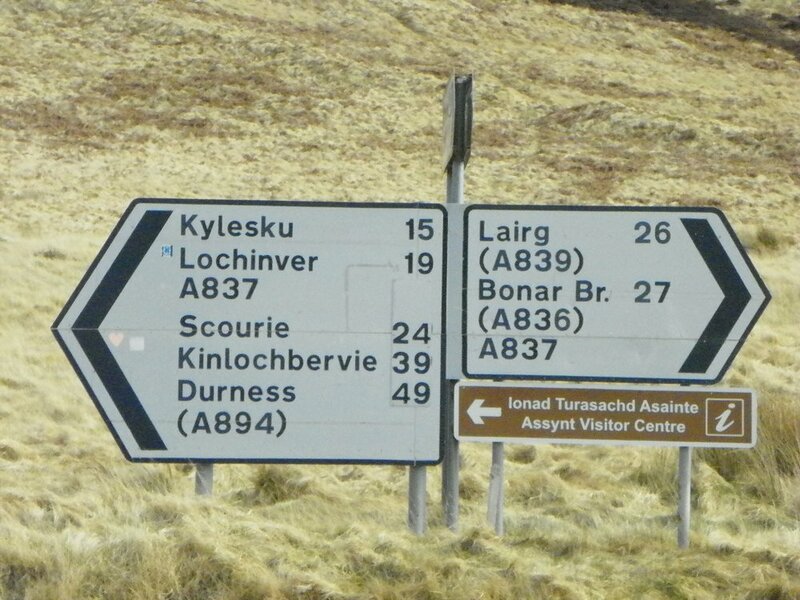 It was only a few minutes more to Durness. I'd seen a glimpse of heart-stopping turquoise, and I couldn't wait for my first look at the sea and the beaches! We parked in the Vistors Centre car park and made the short walk to the beach. I didn't even notice that the wind was trying to blow the hair off my head. All I could see before me was a living, breathing Impressionist painting in bands of green and tan and white and blues, and touches of peach and pink. Oh, those blues of every description and shade! 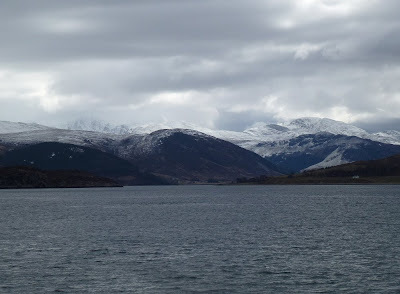 After quite a while, we wandered into the Visitor's Centre to get out of the wind and the cold. 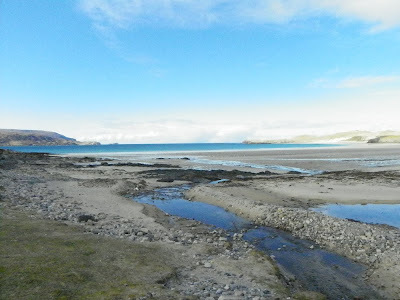 We looked at all the exhibits and at all the items for sale, and then we went back to the car to drive to the center of the village of Durness where we found another car park and walked over to a small grocery store where we bought sandwiches and drinks for lunch before driving on a couple of miles to Balnakiel. There was a place to pull off the road and park not far from the sign above. We sat in the car out of the wind and ate our lunch. Once our meal was consumed, we walked over to the ruins of an ancient church. 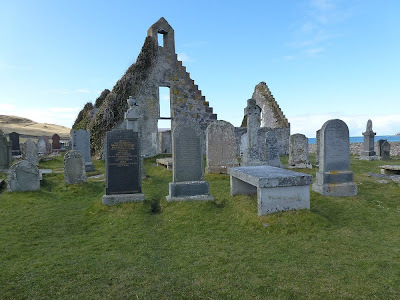 Balnakiel Old Church was built in the thirteenth century and has the grave of Donuill Mac Morraichaidh, a serial bandit and murderer. He's buried inside one wall of the church so "that his enemies couldn't walk over his grave." 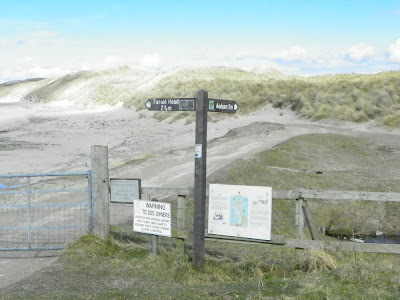 But it was finally time to open that gate and walk through to the beach. A man was playing catch with his dog. A small stream was running down to meet the sea. The track sloped gently to the beach, and I didn't know which was the more beautiful: the sky or the water. Once again, the Highlands had bewitched me. 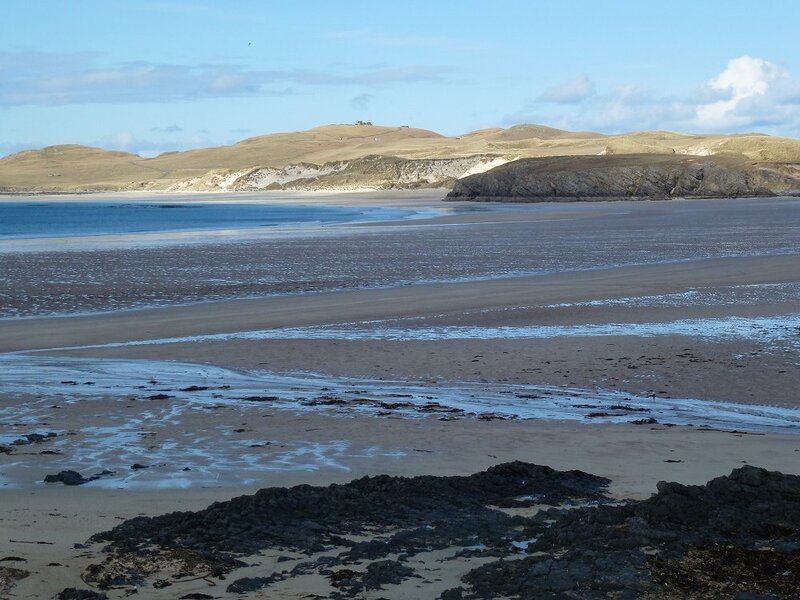 Acres of lovely soft, golden sand to walk! Denis hurried down the beach while I took my time. I know that, although he enjoys life in the desert, he does miss the sea, so we each communed in our own way. 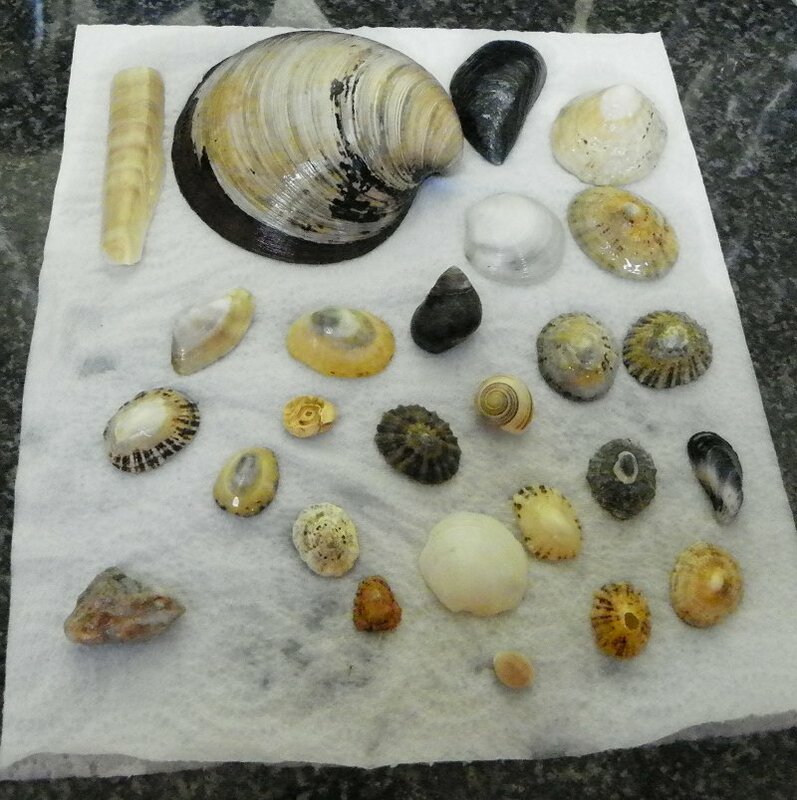 I love to look for shells. I love to stuff them in my pockets as I walk, and that's exactly what I did here. A Beatles' song, In My Life, has a great deal of meaning for me. It means even more to me now because the basis of the song is a poem written by John Lennon about his childhood summer holidays in Durness. Little of the poem remains in the song, but I feel it there, in its heart-- and in mine. 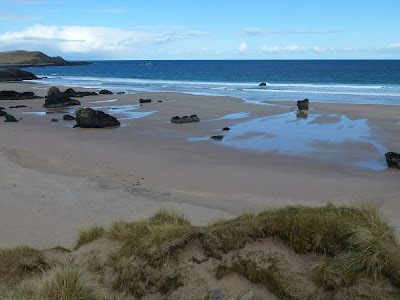 Denis and I have talked about going back and spending a week in Durness. 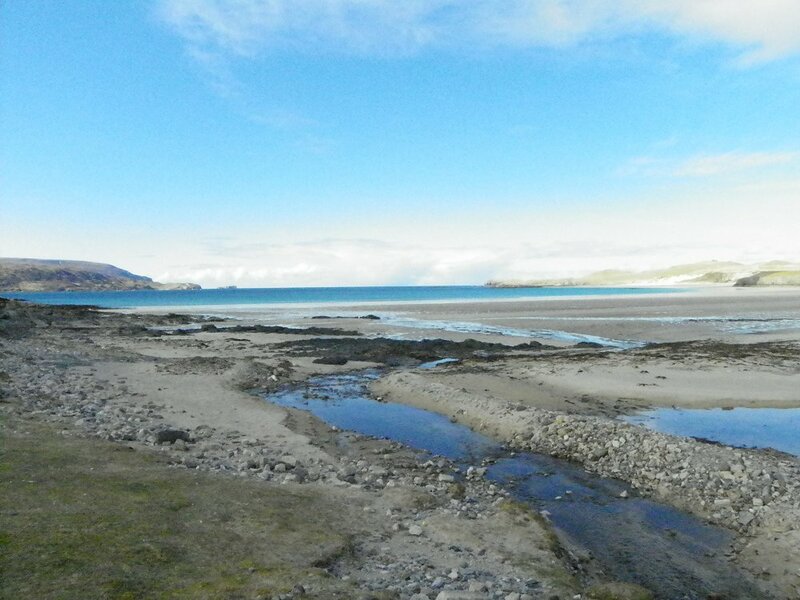 I think it was fate that brought me to a website for the Balnakiel Bothy, a small cottage overlooking Balnakiel Beach, not far away at all from the gate Denis and I walked through that day in March. It's a cottage from which I could walk out and explore all that sand, fill my pockets with shells, and drink in the incredible landscape. To be honest, I doubt that I'd get much reading done. Would you, if you had all that at your doorstep? When we arrived at Manchester Airport to begin the first leg of our journey back to Phoenix, someone at the car rental agency had to vacuum soft, golden sand from the passenger side floorboards of our car. I had seashells tucked away in my suitcase, and they're within sight of me now. 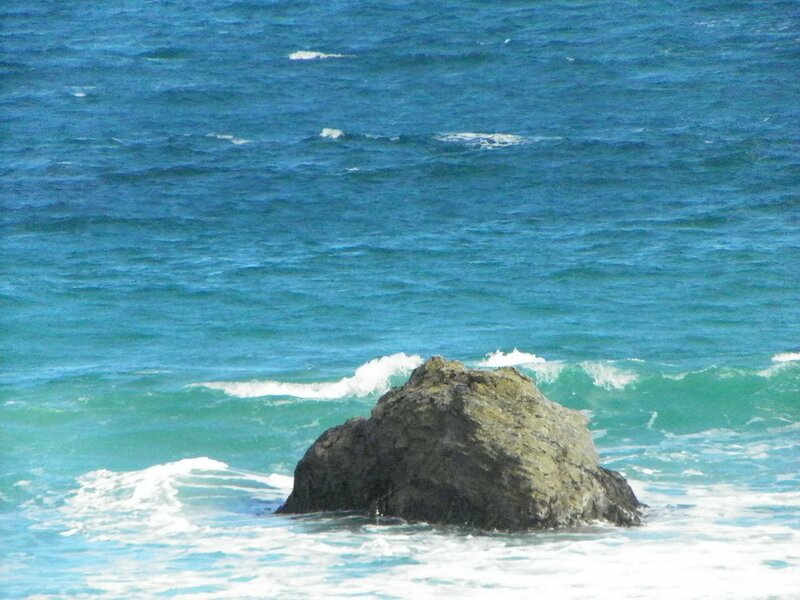 They sing to me of endless skies and sugary sands, and the shimmer of a turquoise sea. Oh what a wonderful post. 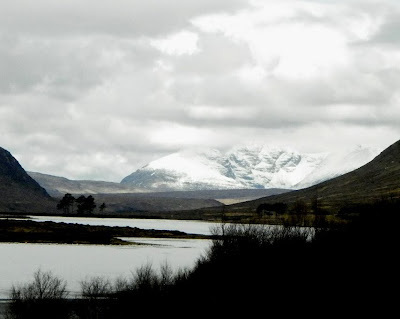 I'm longing to go up to Scotland, we're hoping to go next year and maybe see some of these places for ourselves. Beautiful photos, Cathy, just beautiful. Definitely sounds like an interesting book, Cath. Thanks for the recommendation! Cathy - What a truly lovely place, and a wonderful post. You really do take some stunning 'photos. 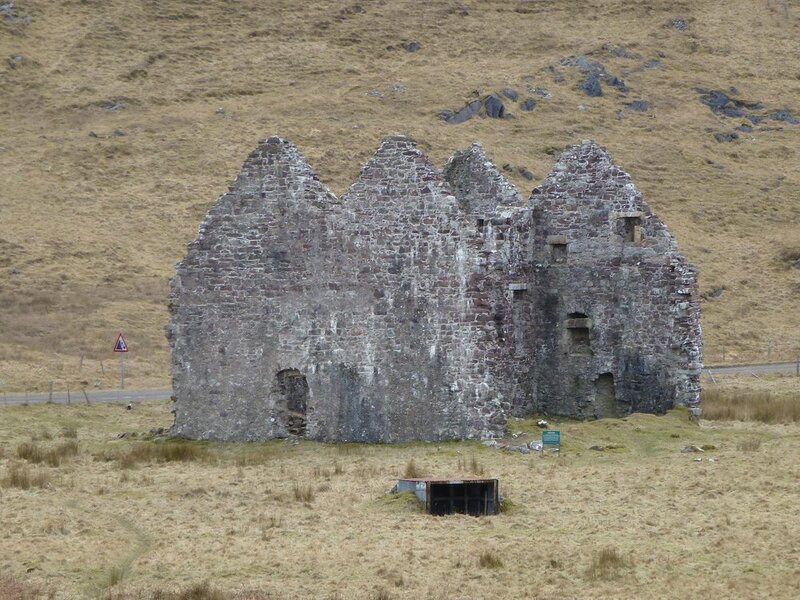 Calda House is fascinating and so is the castle. I just felt drawn to them. I'm so glad you enjoyed yourself so much. Calda House and Ardvreck Castle drew us in, too. We could no more have driven past them than fly to the moon! I bet traveling with y'all would be a blast! By the way, I ALWAYS wonder what it's like to live in remote houses I spy. We tend to enjoy ourselves, and so do those who join us. 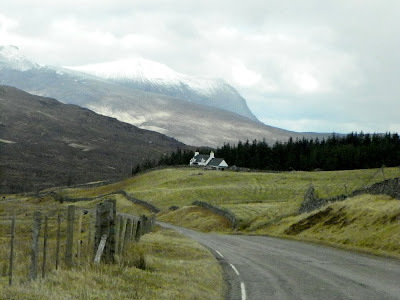 I would love to rent a large cottage in the Highlands and have a group of friends with us to explore. The photos are so beautiful, Cathy! I'd love for my hubby and I to go to Scotland one day. He'd play golf at St. Andrew's and I'd just enjoy soaking up the atmosphere. Here's hoping. They are about to add a nonstop flight from Austin to Heathrow. We may have to skip a trip to AZ and go east across the pond instead. Sounds like an excellent idea, Kay!! 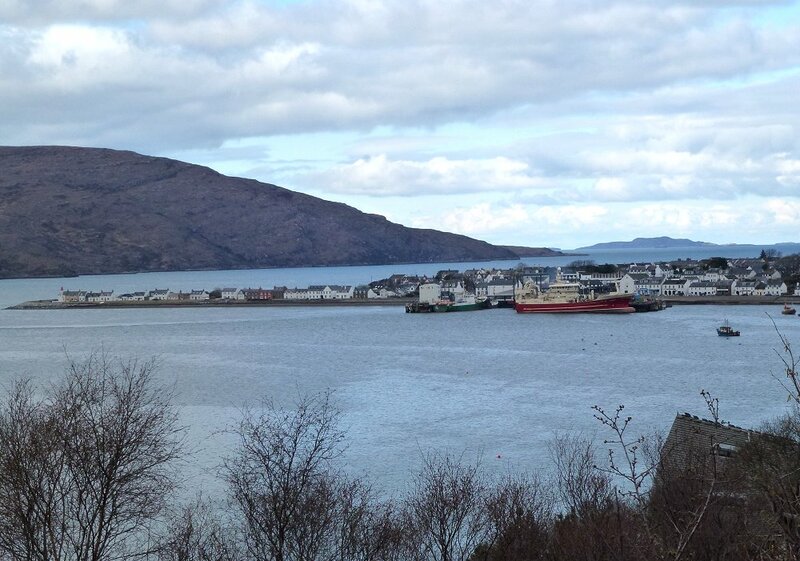 You've made me wonder why we haven't been back to Ullapool in about 35 years, it's about time we had another holiday there. It's stones which I can't stop myself from picking up. Thanks for the lovely photos. I have a habit of picking up stones, too. I have decorative rock piles here from various explorations out in the desert. What absolutely beautiful photos of breathtaking scenes! Thanks for poating them. 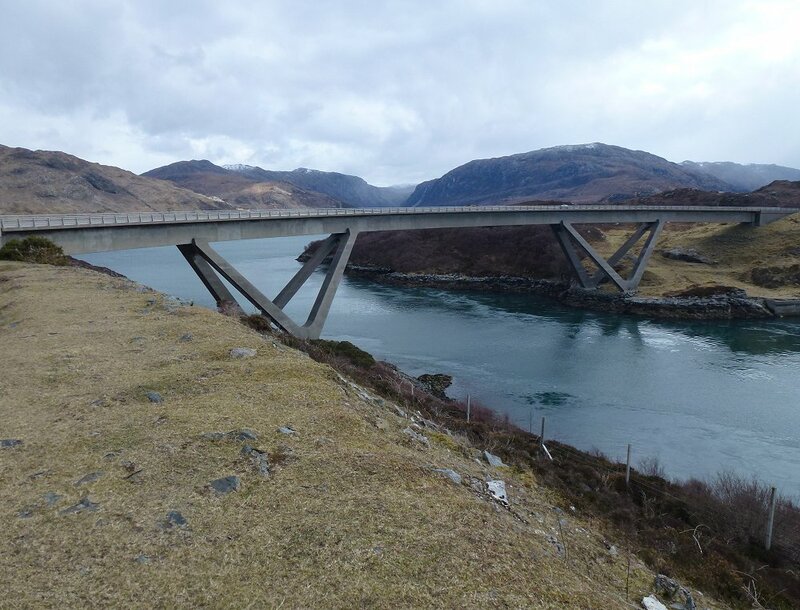 I'm surprised you and Denis haven't already commissioned a cottage to be built just to you in the Highlands! It sounds like a real vacation of a few weeks is needed just to absorb and enjoy the sea and air and space. It's so beautiful it must bring inner peace and contentment. And you might want to read The Sea Detective, by Mark Douglas-Home, if you haven't done so. There are two plot lines, one takes place in the islands off Scotland. If we win the lottery, Kathy, that's one thing I would most definitely think about-- and thanks for the book recommendation! 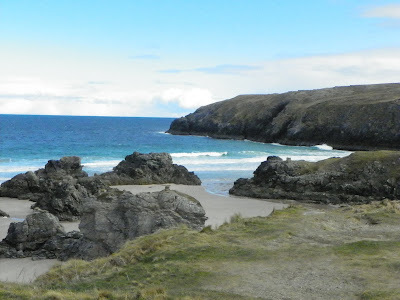 I've been upto and stayed in Durness now 4 times. I don't want it to become a tourist mecca either. 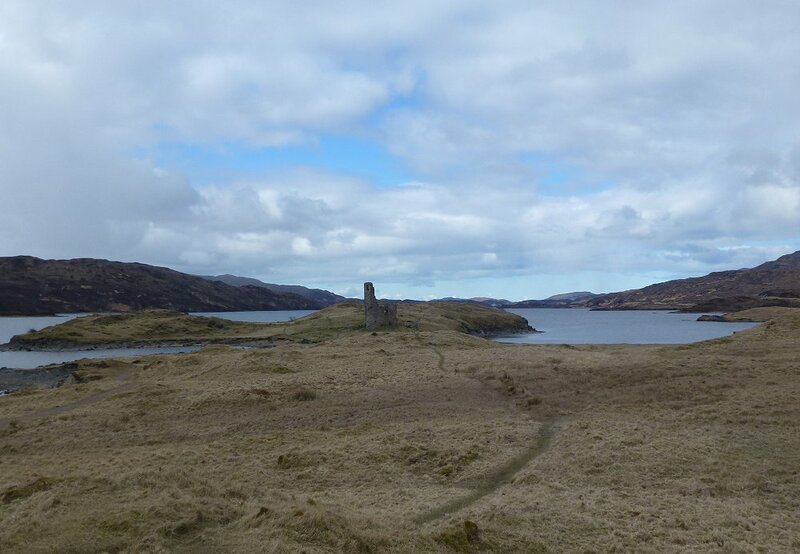 I have plans to stay in Balnakiel Bothy, with a view of the bay from my window and just a short walk to the sea. Bliss!